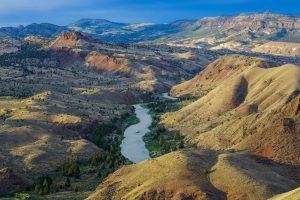 The exhibit connects visitors to water and its management through the lens of three different basins in the region — the Mid-Columbia River Basin, Great Salt Lake Basin and Klamath Basin. It will illuminate how water has shaped the High Desert’s natural, cultural and geological history. It also explores how it features prominently in contemporary issues such as resource consumption, Indigenous sovereignty and climate change. In addition to the discussion of the complexities of water management, Desert Reflections will connect visitors to its significance through visual art, music and spoken word performances. The High Desert Museum commissioned artwork from four Pacific Northwest artists for the exhibition. The project involved a field trip into the desert with experts in order to spark discussion and inspiration for the pieces. Water permeates and sculpts every corner of the landscape. Thus the art of Desert Reflections will extend from the Spirit of the West Gallery throughout the Museum’s interior and exterior spaces. Presentations from multiple artists will create an immersive experience. You will find visual art alongside the Museum’s stream and large-scale art pieces inside the Museum. Bend Creative Laureate and spoken word artist Jason Graham, known as MOsley WOtta, is creating a video installation inside the Museum and an outdoor display along the stream behind the Museum. Klamath Modoc visual artist Ka’ila Farrell-Smith, who looks at art as a means of activism, will present paintings created using traditional Indigenous art practices. Her artwork is in response to the proposed oil pipeline through the Klamath Basin. Harmonic Laboratory, a mixed-media art collective from Eugene, will weave together video, dance and choreography to explore the rhythms of water. And Dana Reason, composer and sonic arts teacher at Oregon State University, will create a site-specific, large-scale interactive sound and performance work. It will utilize research data on water tables in Oregon. To complement the exhibit, a variety of events and programs will offer exciting and deeper explorations of Desert Reflections. There will be a Natural History Pub talk focused on water management in the High Desert. Ornithologist Noah Stryker will join us for a lecture in May. Other programs include a Museum curator-led field trip to the Pelton Round Butte Dam, artist panel discussions and more. All of them will serve to spark dialogue about issues relating to water. For Desert Reflections programming, click here. Click here to discover everything you need to know about your visit to the High Desert Museum! What does water mean to you? Post your photos on Instagram and Twitter with #HDMwater. Click here to see what visitors are posting!